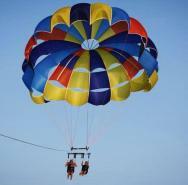 Take to the skies of Grand Bend as you soar up to 1000ft high in this unique experience of parasailing! With 15 years experience in watersports business, the licensed captain and crew will have you up safe and sound in no time! There is no previous experience necessary and all ages are encouraged! Fly off from the boat by yourself or with upto four pending weight restrictions! Banana Boat rides are also available! Come check it out Today! Pre-season and after Season will be open to fishing charters and cruises. Expereinced Wakeboarders and Water Skiers welcome!